Head shakes. I did some reading a little bit. I don't get it. It seems bad and I'm scared there's something really wrong. I've never seen that before. It doesn't look like any kind of seizure or something like that. She seems fully aware and at the end of the video just relaxes like normal. It's very interesting. Maybe reaction to the noise of the tv or something? Does she do that when it's totally quiet too? Never seen it before. I recorded about 3 mins before that as well. Tony, is this happening often or was this just a one time thing? I just watched it again a few times, her eyes do "droop" a bit at times, independent of each other...like her right eye starts doing it first. I really don't know dude. I hope someone here can help you though. If I may ask, what is your new flea med? I'm hoping Meredith sees this and checks in. That does look neurological. I'd strongly recommend showing that video to your vet. Also, keep a journal and make an entry every time she does that. Record everything you can, how long it lasts, circumstances around it, changes you've made in her life recently, really everything. 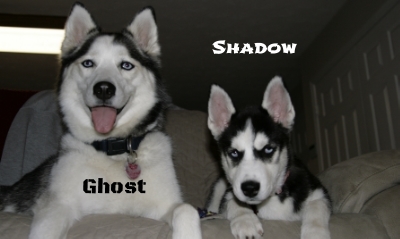 Not all seizures are the classic grand mal type, more often than not Shadow had something more like what Bandit is showing than a full on grand mal. Good luck dude, and please don't hesitate to give me a shout if you need. My mother-in-law has a Beagle that has a similar issue only her head shakes are a little more pronounced than that. Usually starts in if she has been playing or running hard but isn't defined by those parameters either and has been known to do it with seemingly no trigger. I will ask her what is the cause of that dog's issues. I was thinking it was a neurological issue but the vet didn't deem it to be severe enough to have her on a permanent medical routine for it. She's lived with it for years this way. It may not be the same thing but it does look similar. Her episodes would last up to a half hour and she would wander around the house with her head shaking sometimes. Also, did they put her on any medication for her tail chewing? If so, call your vet right away and tell her. How long ago did your brother notice this issue? Besides the generalized seizures (Grand mal) there is the Focal seizure (which affects a certain limb or one side of the body) and the Psychomotor seizure( which causes strange behavior like attacking imaginary objects) that's why I originally said it didn't look like a seizure to me, mainly because it didn't really fit in what I saw in the video. The very end when she lays her head down is what confuses me ...she just appears so normal there, there's no obvious gap between a "seizure" and her back to normal stage. The way she seems aware of what's going on around her too, that's why I asked about the tv noise, at times, even though her eyes are intermittently fluttering, she seems to react to the voices in the background. At one point there is no talking going on and when it starts back up, I see her look in what I'm assuming is the direction of the tv. Anyways, the shaking definitely does look concerning , besides the head shaking, her eyes fluttering , she appears very thirsty...something is definitely going on, I hope you will let us know what the vet says, I also think Amy and wpskiier brought up two very good points with the meds she's on now, and I'm not saying it's NOT a seizure, especially since I've only dealt with the grand mal type, but since blueyedghost has dealt with different kinds of seizures, I'd give it serious consideration. My girl Anushka had petit mal and grand mal seizures. She never showed a head shake like that through the pre ictal to post ictal phases. Hers were very sudden onset though with no real pre ictal phase. Like the others said I'd show that video to the vet. Also, like Artic-wind touched on, when a seizure happened in my dog (regardless of severity) she had no clue what was going on around her. She would go blank and only realize she was laying down in my lap when she came to with no recollection of how or why she got there. Bandit seems to be fully cognizant through out the episode. Tony - I showed the video to my husband - first off, he is a PEOPLE doc, not a vet. His first thought was this looked like the titubation (trembling head shaking) of an elderly person or a partial seizure - the partial being that there is no loss of consciousness. He also noted that in people, high doses of benedryl (as all anticholinergics) can cause seziures. He reiterated what we have all said here - show the video to your vet. My mother-in-law's Beagle that did this was apparently having a mild seizure (she didn't know specific type) but not strong enough to cause damage. Vet never put her on meds for it since they were not apparently affecting her quality of life nor causing any damage after. He believed for her that trying to find the proper dosage of meds for her could only make the seizures worse and opted to wait until they became either more severe or more frequent (they never did). I would definitely have your own vet make his own determination on this and see what is the best course of action for your dog. I agree with everyone else, show your vet that video. I am also going to through this out and ask if Bandit is on Comfortis? My Miya had no head shaking, but had small, what I though to be tremors when she slept just after administering the Comfortis, I stopped using it right around the time she was 8-10 months old, because I felt it was not safe to give to her. She doesn't do this anymore.